A horoscope is the map of the sky when the child took his/her first breath in this world as an individual. In other words, a horoscope is plotting of the geocentric positions of the planetary bodies in relation to earth, as they move through the ecliptic in their annual journey around the sun; and in relation to the daily motion of the earth is recorded through calculations. The celestial bodies in that particular time imprint the person`s destiny and personality in the manner unique to that person only. A natal chart is a tabular representation of all the planets mapped against the zodiac they were moving at the time of birth. 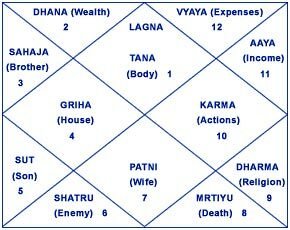 This astrology chart helps in deciphering the physical self, person`s inner psyche, and the destiny one has to fulfill. Horoscope is truly considered as the blueprint of our life. It is a dream to every being on this earth to achieve his / her fulfillment in life. The `kundali` is the guiding Map for that ultimate goal. A horoscope is defined as a mere, but very important Map; The ultimate cosmic force of all being a Human Free will. A poet might say that a horoscope is the cosmic song sung just for you by the heaven. Horoscope reading requires great patience and a deep study of knowledge accumulated through thousands of years. It is an art to gain an uncanny insight in the details of one`s life.